Los Angeles is the beginning of a search for Edward Hopper’s paintings and watercolors. Hopper’s pictures spend most of their time hidden in storage in an eclectic group of museums, galleries and private collections across America. Through his pictures, I’m searching for a clearer view of Hopper himself, one as untouched by time as possible. I’m also on a search for America. I grew up in the Washington, D.C. area, having spent the first four years of my life in Papua New Guinea and Australia. As a child, I identified myself as a Washingtonian first, an Australian second and an American third. It was only on my return to Australia, at the age of eighteen, that I became intrigued by the country I had grown up in. Through separation, my relationship with America grew more fond and more complex. Here was a place which was defined both overseas and on its own shores in terms which were alien to my experience. People calling America nationalistic or patriotic, corrupt or righteous, missed the point. These terms oversimplify the American experience but in fact they are not reductive enough. Hidden underneath the warring duel over America’s identity is a core idea that makes America what it is. It is palpable yet frustratingly inexpressible. It is this core which makes America the place of dreams and desires for so many. The closest I, and many others, have come to grasping America’s identity is in Edward Hopper’s pictures. Therefore, a search for Hopper’s pictures, scattered across the four corners of the United States, is a search for America. And for me, a search for America is a search for home. I feel at home in Los Angeles because I have family here. Most foreign visitors, and indeed most Americans, feel out of place here. It is a fantasy land of golden freeways and fire-stricken foothills. Edward Hopper was a native of New York. He disliked the alien architecture and climate of this outpost of American civilization. Late in his career, Hopper would return to undertake an artistic residency in Pacific Palisades, in the northern suburbs of Los Angeles, but this too was a frustrating and unproductive experience. Although Los Angeles is the most visual of cities, it is not well known for its fine arts. In recent years the renaissance of institutions such as the vast J. Paul Getty Center have improved this. The Getty lords over I-405’s eleven lanes of concrete as the freeway carries me north. Hopper himself was entranced by the movies and spent a significant part of his idle time in matinees. Much of his career, which spanned from the 1920’s to the 1960’s, pre-dated the astronomical rise of post-war Los Angeles. The explosion in wealth in Los Angeles has naturally led to a strong art collecting culture. Steven Spielberg, Barbra Streisand, Steve Martin and Frank Sinatra have all collected Hopper’s work. A prominent art collector who visited Steve Martin’s home described him to me as ‘very smart, very modest and very quiet. He’s not like his persona at all.’ Many of the collectors we’ll meet have such an intimate connection to their pictures that they can’t bear to sell them. Martin, on the other hand, enjoys selling as well as buying art and asked the collector, himself an owner of Edward Hopper’s pictures, what he thought his Hopper painting, ‘Captain Upton’s House’, was worth. 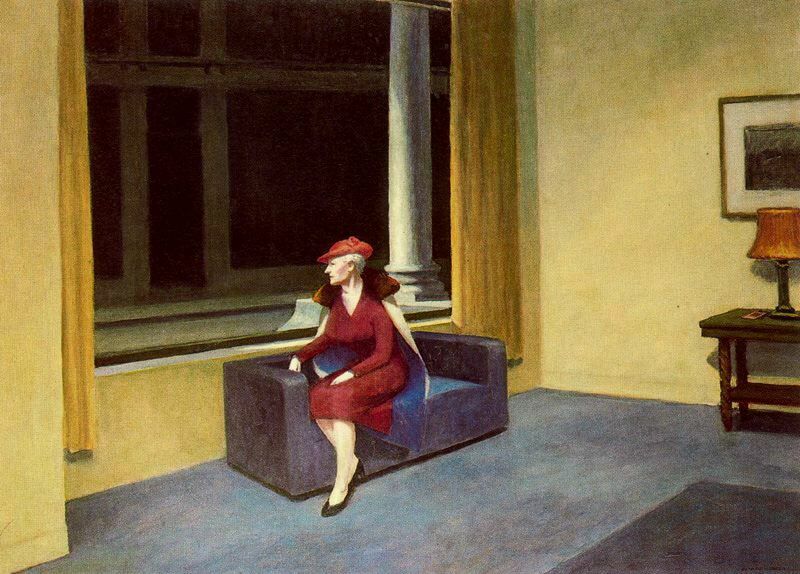 When the collector told him that he knew someone who would pay $25 million for it that day, Martin gasped and then in short order bought a second Hopper painting, ‘Hotel Window’, for $9.5 million. This turned out to be an astute purchase and one for which the collector friend of Martin’s is still, only half-jokingly, chasing him for a commission. ‘Captain Upton’s House’ is on loan to the Hopper retrospective in Boston. The rest of the privately held Hoppers in LA remain secured behind closed doors. I am therefore limited to viewing the two publicly held Hoppers in the area, which are nestled in genteel enclaves with holy names: Santa Barbara and San Marino. Do you loathe Los Angeles or love it? Share this post and tell the world!